The Genie Z-62/40, a compact articulating boom lift with improved vertical and horizontal reach, manoeuvrability and servicing, has been released in Australia. 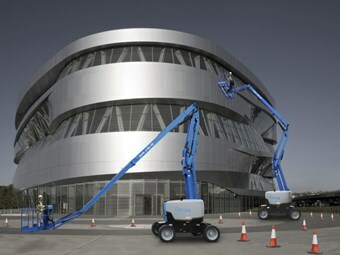 The Genie Z-62/40 articulating boom lift. "Genie has completely re-envisioned the previous model boom lift to make the new Z-62/40 boom better fit customer needs in today’s marketplace," says Brent Markwell, Genie territory sales manager for NSW and the ACT. 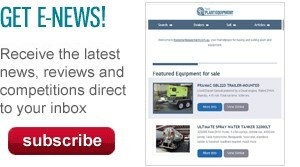 "We increased the height, outreach, transportability and key features while decreasing the overall weight of the product. "This is sure to be a sought after machine with our customers in a wide range of industries, including construction, mining, petrochemical, telecommunications installation and maintenance," Markwell adds. He says the goal in designing and producing the new Genie Z-62/40 boom lift was to build on and enhance the strengths of the previous model — the Z-60/34: "It’s an evolutionary process whereby the new model offers features and key product specifications that customers ask for and desire the most." The working height has been improved from 20.39m to 20.87m, horizontal outreach has grown to a maximum of 12.47m from 11.05m. The elevated work platform can be lowered to 2.26m below ground level, has up-and-over clearance of 8.13m and has a 1.52m jib with increased vertical rotation of 135 degrees, up from 90 degrees on the older model. "The Genie Z-62/40 boom lift has a larger working envelope than its predecessor," Markwell says. "This will help reduce rental companies’ inventory costs, because previously they would have needed to buy a significantly larger and more expensive machine to achieve the extended reach and capabilities of this new model. "Furthermore, all these benefits are enhanced by a machine that’s compact and highly manoeuvrable. Weighing just 9,934kg, it has zero tail swing, and minimal front turntable tail swing. Overall, the Genie Z-62/40 boom lift stows to the compact size of 7.58m with the jib tucked." The unit is highly manoeuvrable even when elevated though the use of four-wheel drive and full-time oscillating axles, with an inside turning radius of just 2.36m. It’s also able to climb gradients of up to 45 degrees. Manoeuvrability is even better when the machine is fitted with optional four-wheel steering, meaning it can be ‘crab steered’ into the tightest position. Markwell says another great feature of the Z-62/40 boom lift is its Genie Fast Mast boom system. "With this, operators can descend and retrieve needed tools or materials and quickly return to working height," he says "Also, the dual parallelogram lift linkage allows precise positioning of the platform on the jobsite for improved accuracy." Serviceability has been improved through the use of a swing-out engine tray to allow easy access to either side of the engine assembly to quickly service the starter, exhaust or filters. Markwell says the Genie Z-62/40 boom lift will be shown at the Hire and Rental Industry Association (HRIA) Convention in Adelaide from April 28-3, 2015. Click here to find boom lifts for sale.